Having successfully resisted pressure to provide full dark fibre access to high bandwidth customers, Openreach is proposing a managed but scalable alternative. Back in the middle of 2016 Ofcom decided Openreach should offer dark fibre access (DFA), but the latter referred the ruling to the Competition Appeal Tribunal, which overruled. Openreach accordingly pulled the plug on DFA, but promised to come up with an alternative. In an interview with Telecoms.com, Openreach General Manager of High Bandwidth and Passive Services, Darren Wallington explained that alternative has been presented to Openreach customers this week and takes the form of OSA Filter Connect. OSA stands for Optical Spectrum Access and, in essence, this proposal aims to decouple connectivity and scalability. There will now be a one-month consultation period, the results of which Openreach aims to respond to by early December. OSA itself has been around since 2009. It’s designed for B2B high bandwidth uses such as financial services, datacenters and public sector as well as optical backhaul. Historically it has been a fully managed service but it seems that customers want to be able to scale their bandwidth independently. The diagram below illustrates Openreach’s proposed solution which combines at least one managed wavelength (the yellow/purple lines) but then all the other wavelengths are controlled directly by the customer. 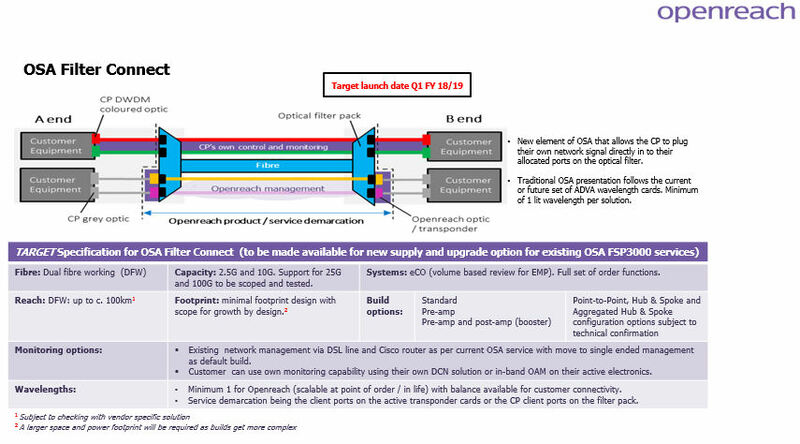 Currently OSA has 4 and 32 channel options, but Openreach intends to introduce 8 and 16 channel ones too. The technology currently supports up to 10 Gbps per channel but expects to support 100 Gbps at launch, which would, in theory, enable a bandwidth of over 3 Tbps. We asked why Openreach is so resistant to DFA and Wallington explained the biggest drawback concerns response and repair time. While Openreach itself has at least one channel open it can monitor the network and commits to a 5-hour response time, but it has provided evidence to show that in the case of DFA the best it can offer is 18 hours. Regarding the historical allegations that Openreach may not treat all its customers in the same way Wallington pointed to its Equivalence of Inputs obligations as well as the high level of scrutiny it faces from the likes of Ofcom. On the matter of pricing he was keen to point out how competitive the high bandwidth market is, and with the likes of Colt, Virgin Media, Verizon and Vodafone among its competitors, that’s hard to argue with. Wallington said the proposal appeared to be warmly received by customers and if the consultation results in a green light OSA Filter Connect could be live as soon as 1 April 2018 and will even be backward compatible. There have been many legitimate grievances levelled at BT/Openreach by its customers in the past, but this comes over as an honest, well-intentioned proposal to resolve their concerns and deliver a solid solution. Let’s see if those customers agree.